Do you live in New York City, Nassau County or Suffolk County and have phobias or anxieties? 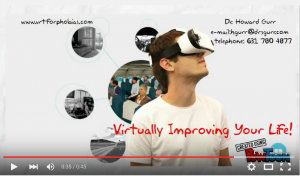 With the use of Virtual Reality Exposure Therapy(VRET) I can “Virtually Improve Your Life”! I have offices in Bellmore and Dix Hills, New York. I also provide on-site services. My system is portable and I can come to your home or your office! 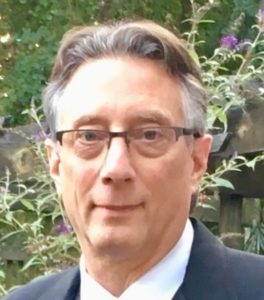 For any questions, please call Dr. Howard Gurr at (631) 780-4877, email me at hgurr@drsgurr.com or go to our contact page. Visit Virtual Reality Therapy For Phobias’s profile on Pinterest. I have been fascinated with the possibilities of using Virtual Reality Therapy to reduce phobias. For over ten years, I have been watching the evolution of Virtual Reality Therapy. Ten years ago, the cost for the equipment alone was over $100,000.00, far beyond the reach of any private practitioner. A few years later the equipment costs dropped to half of that initial price, but still beyond my capacity. About five years ago, the systems were less costly, but the software costs to develop the virtual environments were still too much. Now, with the use of cellphones and better virtual reality headsets, the capacity for VRT has become realistic for my practice. 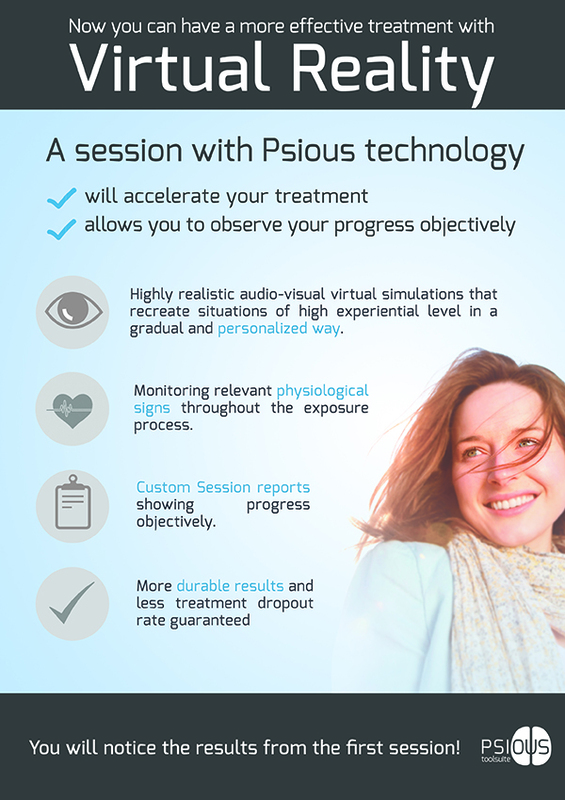 Why use Virtual Reality Therapy? On average, the number of sessions needed for Virtual Reality Therapy is low, between 6 to 12 sessions. Therefore, it is faster and less expensive when compared to traditional therapy. The virtual environments are very realistic and customizable, making the exposure therapy more effective. The success rate has been reported to be approximately 90%. In the initial session, the patient’s history is taken. The patient is taught the basics of anxiety reactions and the skills to reduce anxiety reactions. The subsequent VRT sessions follow a standard protocol and are matched to the patient’s level of tolerance. The therapist is able to monitor exactly what the patient is seeing and hearing. If the session produces too much anxiety, the patient can request to stop, return to an easier stage, or even just remove the headset to terminate the experience. Are there any issues or problems associated with VRT? A small percentage of the population may experience motion sickness (nausea, vomiting, ataxia, disorientation, eye strain and vertigo) due to “sensory cue incongruity”. That is due to differences between what they are perceiving in the virtual environment being different from what their body is experiencing. However, it should be noted that improvements in the lag time between the virtual images and head movements have reduced these side effects for many people. What ages do I serve? I work with school age children to adults of all ages. Is VRT covered by insurance? VRT falls under the category of Exposure Therapy. It is considered an individual therapy session. I am not on insurance panels, but I will electronically submit claims on your behalf. You will receive whatever portion of the claim your insurance company reimburses you for out-of network providers. Please note, services rendered in regard to legal cases are not reimbursable by insurance. 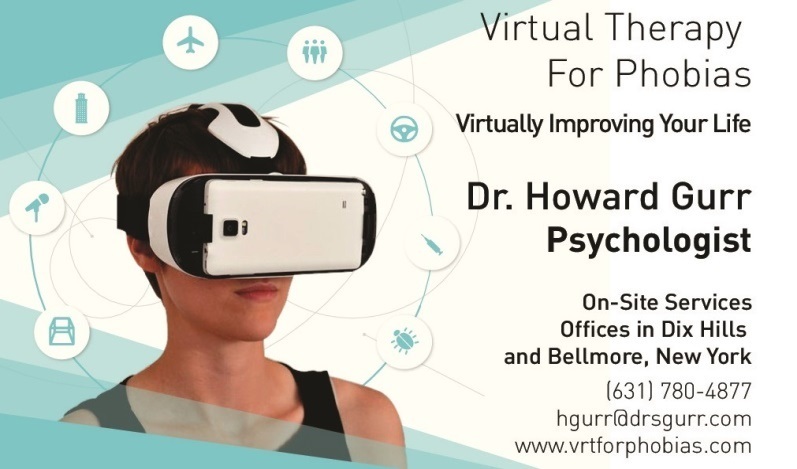 To see resources and links about Virtual Reality Therapy, click here.